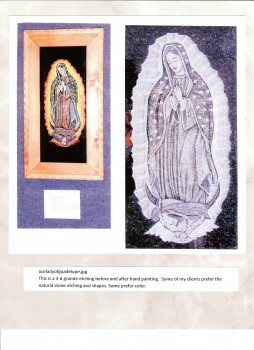 The 3-D carving of Our Lady of Guadelupe is a combination Etching/Sandblast/carved work. It works out well in simply stone, and is beautiful enhanced with color. 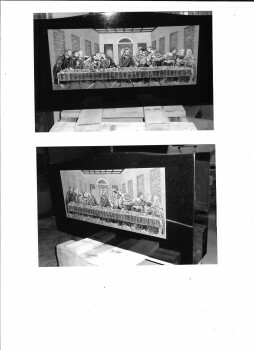 The Lord's Supper is a 36" carved/etching on a 48" monument. The background is carved in layers, and the polished surface is etched. 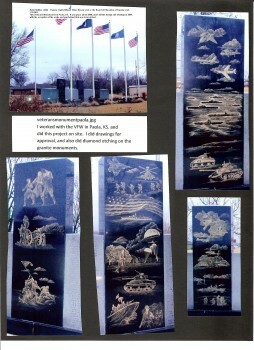 The Veteran's monument is in Paola, Ks. The work was done by hand-etching on site, and filled with 14K leaf gold.